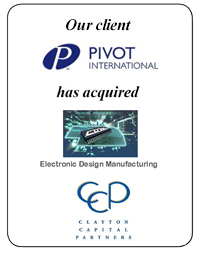 Pivot International has acquired Electronic Design Manufacturing. Pivot International ( www.pivotint.com ) based in Lenexa, KS,is a well established and full-service product design, development, and manufacturing firm that serves customers in a wide variety of industries. Electronic Design Manufacturing ( http://www.nebraska-electronics.com ) based in Omaha, NE, is an electronic manufacturing services company that specializes in commercial/industrial, consumer, energy, medical, military and telecommunications markets.